Is it just me, or has the onset of winter sucked dry any creativity or motivation to do… almost anything? We are 9 days past the shortest day of the year. Shouldn’t I notice an additional 9 minutes of sunlight somewhere? Instead it has been a bit gloomy during the day on most days of the week, and getting up before 6am could almost be like getting up last night. Part of it is that I’ve been unable to run as I would like due to a hammy/glute issue that has yet to settle down. Yes, the foray into both boxing and a bit of cross fit hasn’t helped that issue, but it’s kind of like rebelling against being injured, and all runners do that. Of course, the injury didn’t stop me joining Grant on a run this morning, although I would say that both of us were doing what my dad likes to call ‘practicing’ running, rather than actually ‘training’. Which is apt, really, as Gold Coast half is just a week away, and I need the practice running given that I’ve had a handful of runs in the lead up. The run aside, I’ll be in good company and hopefully good weather will prevail. Due to aforementioned lack of creativity, I’ve split my post this week into two categories: food news and nutrition news. While I think that, for most people, it’s better to eat three meals per day and feel satiated by those meals, that’s not going to work for everyone. This list of snacks gives you loads of great ideas if you’re someone that has high energy needs or has an active job for which snacking is more practical than actual meals. Yum. The slow cooker is getting a really good workout this week. I chucked a whole chicken in there yesterday with a bulb of garlic cloves in the chicken cavity, leeks lining the bottom of the slow cooker, and rubbed paprika, oregano, cumin, coriander and salt over the entire chicken (mixed around 2t of each). I cooked it on high for around 5 hours and it was falling off the bone (which is how I like it). And right now I’ve got some lamb chops in there, Mediterranean style. Yum. My cinnamon on vegetables theme continues, with swede and carrot chopped up and roasted in coconut oil with cinnamon sprinkled on it as a staple of late. I noticed this week that Scott (a post-grad student up at AUT Millennium) was eating a kumara with some cinnamon sprinkled on it. He put it down to being from the US and having sweet food as part of a main meal, which reminded me of a Thanksgiving dinner my friends My friends Kyle (a Colorado native) and Jenny put on one year when we were post-grads in Dunedin. I remember a dish that contained both jelly and marshmallows, which was served with the main meal. Weird. Anyway, if you enjoy cinnamon then you can enjoy it even more in the knowledge that it’s been found to lower blood glucose levels after a meal in people who are at risk of, or have type 2 diabetes. This is in amounts that you would normally use in a meal. If you’ve not tried it on roasted vegetables, then branch out and give it a go. Alternatively, have it sprinkled on baked apple with yoghurt as part of breakfast. A new recipe I tried this week is from Make it Paleo, a cookbook by Bill Staley and Haley Mason from the Food Lovers Kitchen. Don’t let the slightly cheesy cover fool you, this cookbook is gold, and contains super easy recipes. I was curious to see how the eggplant base would turn out. The original recipe is here, and my version of it is here. It is delicious, and my only issue right now is that I have to get through lamb chops, slow cooked chicken and pizza before I leave on Friday. Hmm. First World Problems. Lack of creativity evident in choice of frame for this picture. For the geeks amongst us, Grant told me about this paper from the American Journal of Clinical Nutrition that was published in the 70s. It’s interesting that carbohydrate restriction of between 50-60g per day was the dietary method of choice for many physicians to treat overweight and obesity in Britain, and the paper showed the nutrient value of such a diet (which was low calorie compared to a normal diet) was not compromised by the lack of carbohydrates. Along the same lines, I came across this paper that was published in Diabetes Care showing that a higher protein diet lowered markers of oxidative stress in the body more than a higher carbohydrate diet for obese women following a calorie restricted diet. Protein has been shown to be beneficial in terms of satiety for those who are dieting, and is also important for maintaining muscle mass, but this is the first study that links it with a reduction in oxidative stress, the underlying cause of disease in the body. 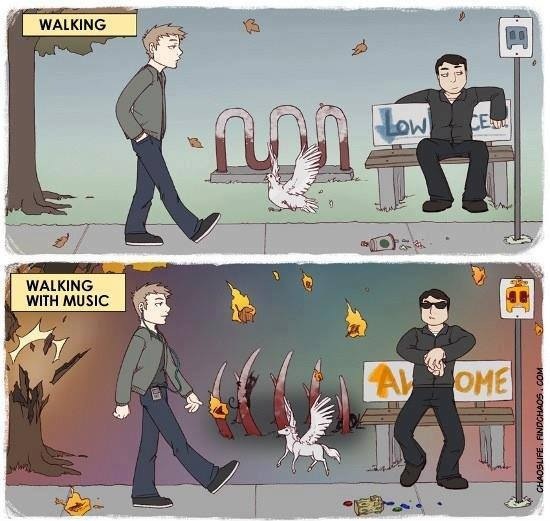 Finally, I love music, and when I saw this picture below I immediately related to it. Although we are in the depths of winter, it could be worse. I could be in Dunedin (love Dunedin, but it’s damn cold down there right now). And, like anything, you just have to control the controllables and ride out the rest. Life’s too short to be wallowing in the mundane, so use the right tunes to turn it into a hit musical like I do. If you like musicals. Life is good. I’m using my home ‘tens’ machine, trying to find the delicate balance between just enough neurostimulation on my calve muscles to loosen them off and electrocution. 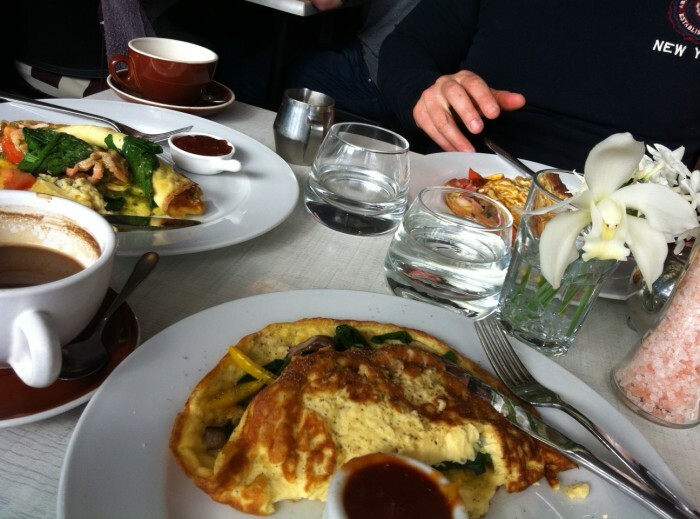 I’ve just arrived home from brunch with the Conlan-Bangs, at the absolutely awesome café Marcello’s who do amazing omelettes (4 fillings, $14), good coffee and everyone (bar us) who walks in gets a hug. Very Friends-esque. We hypothesised as to how many visits it would take to get a cuddle and it’s likely we will find out because we will definitely be back – so I will update you. I also remembered to buy handwash for the bathroom (finally), the slow cooker is releasing an aroma of lemon, garlic and olives and this song is playing on the radio. Such a good price for such an Amazing omelette! Marcello’s on College Rd in Freeman’s Bay. 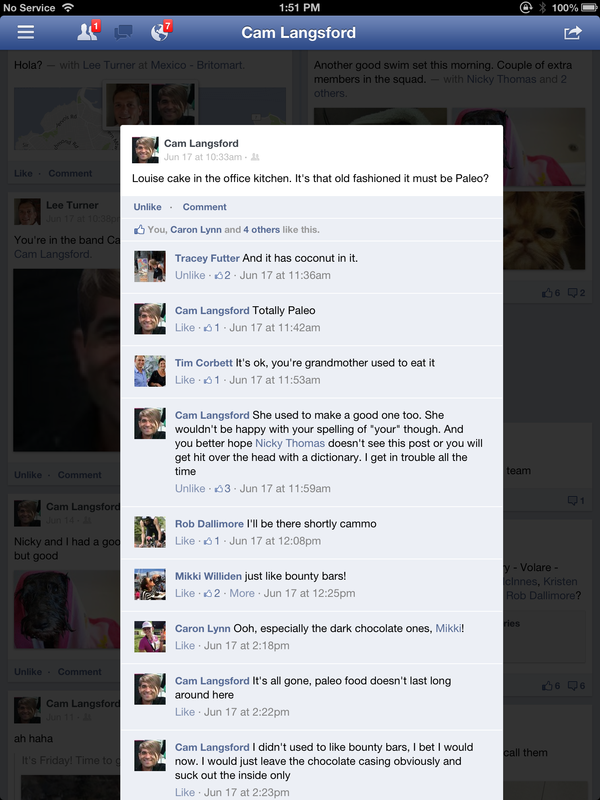 Our friend Cam’s post on facebook re Louise slice. Click on pic for a better view. LOL! HCB’s conversation with someone re having a paleo approach to diet. When explaining that she’d given up wheat and sugar, the person responded with “oh, so you’ve given up having a life, then? What’s next, you’ll start doing cross fit and preaching about it on Facebook” LOL! Another conversation HCB had with a friend about ‘paleo’ who said their hesitation for the whole food approach to eating was “I just don’t think that I can do paleo”; They had just finished dinner at a Spanish restaurant where they enjoyed steak, salad, sautéed vegetables. HCB responded with “It’s not hard, I just did it then” which made us both crack up as we then slotted that comment into just about every conversation afterwards. So that last one might be a ‘you had to be there’ moment, but the idea that applying ‘paleo’ principles is ‘doing’ or ‘not doing’ something is quite funny, when you think of what it actually means. In fact I’ve been ‘doing’ paleo all morning: I got up after a great sleep and started with a very easy run with Grant around Devonport, taking in both Narrowneck and Takapuna beach. The sun was shining, the water was calm and we both acknowledged how happy we were that we were as unfit as each other. (Yay! Running!) Then I made my way around Takapuna market to buy eggplant, lemons, coriander and parsley for my slow cooked lamb roast and to make babaganoush (all Greek like). Then I caught up with HCB and Steve for brunch where we had the aforementioned omelettes and some good laughs and a catch up. And now, after finishing this blog I’m going to go through the InStyle magazine I bought, look for outfits I like then see if I can emulate any of them in Glassons. How is all of that Paleo? Digestion starts in the brain, not the mouth: Diane Sanfilippo was talking about this on an interview with Jimmy Moore on Ask The Low Carb Experts. Why does this matter to you? Think about the environment you might normally eat in. Do you often eat standing up, while doing something else? Do you often eat in your car on the way somewhere, and may be stuck in traffic? Do you eat at your desk at work because you don’t feel like you have time to take a lunch break? Are you often rushing from one task to the next, and eating is something that is secondary to all of the other things you are doing? Then you may be creating an environment where your body isn’t responding appropriately to the foods you are eating. This isn’t just about weight and fat loss, it’s about your ability to absorb and utilise nutrients properly. Slim people can have metabolic health issues too. So… what to do? Something I encourage all of my clients to do is to make time to eat. Doing this takes discipline – it can be more challenging that actually changing the foods we eat, but just as important. Write down whatever is on your mind that might be causing undue stress, (be it a list of tasks you need to do, or a problem that needs your attention) so you feel that you’ve taken some steps to address this before eating. By focusing on creating a relatively stress-free environment to eat in, this will become a habit over time and ultimately aid your body to have an appropriate hormonal response to the food you eat. On that note (food), I made two soups this week that you’ll find in the recipe section: broccoli and blue cheese soup and a beetroot and cauliflower number. As these are relatively low in protein, I’d definitely back them up with a source of protein such as a mini frittata, a couple of chicken drumsticks or a tin of salmon. There you have it: lunch. Breakfast at 8am, starving by 10am? Better ideas for breakfast. The girls are used to me banging on about nutrition – I’ve been doing it for 20 years. This time, I thought I’d be more understated. Breakfast, though, can be a different story. It’s hardest for people to give up their usual fare for something different, particularly when you’re fighting against 20 years of jam on toast. So, on Saturday I asked what they usually have for breakfast, both Laurie and Hayley said “toast.” Hmm.. .Not going to find any bread in my freezer. “Well would you have eggs and bacon? “ Laurie looked a little taken aback – and when I made the kumara and bacon hash, scrambled eggs, and a green smoothie to go with it (every meal is an opportunity for vegetables), they both loved it. I’m pretty sure they were coming up thinking about all of the foods they wouldn’t be ‘allowed’ to eat under my watch (because, yes, I wield my ‘older sister’ power over them); they didn’t think about all the foods they COULD be eating. They looked on with interest as I made a coconut slaw and frittata for my lunches during the week too. Super easy, super satisfying – just like breakfast. Of course, despite my best attempts, I couldn’t control all meals, though most were awesome. And since we’re talking about the first meal of the day, most people are used to a lighter meal, and predominantly carbohydrate based. I’m constantly surprised at the number of people who eat a breakfast almost completely devoid of protein, are starving by 10am, and think nothing of it. From the 20 year administrator who walks 30 minutes a day, to a top-end age grouper male triathlete training and racing Ironman. Just because it’s common to eat breakfast at 8am and be starving at 10am, it doesn’t mean it’s normal. It might be satisfying at the time, but what you eat at the start of the day really affects how you feel, what you eat and how much of it you eat by the end of the day. The addition of protein can make a massive difference, though it can be hard to convince some people to eat more at breakfast, particularly those who come to me with a weight loss goal in mind. Some people don’t trust that eating more earlier will result in eating less (or choosing better foods) later. However (their) actions speak louder than (my) words, so, if the aforementioned is you, give it a go. Eggs have to be one of the most satisfying foods out there, in part because of their high protein content. Of course, there are some higher protein cereals out there that promise greater satiety and longer lasting energy than your standard box of grains. However, sorry, additional protein in cereal (by way of added gluten – thanks Jamie and Anastasia from Whole 9 for pointing that out) is not going to fill the gap the way animal protein does. Six grams of protein from an egg, or 14g from a small can of salmon will keep your blood sugars more stable, your energy levels higher and see you through to lunch in a way that a bowl of Nutritgrain or Special K never could. To be honest, adding gluten to cereal is like double trouble. 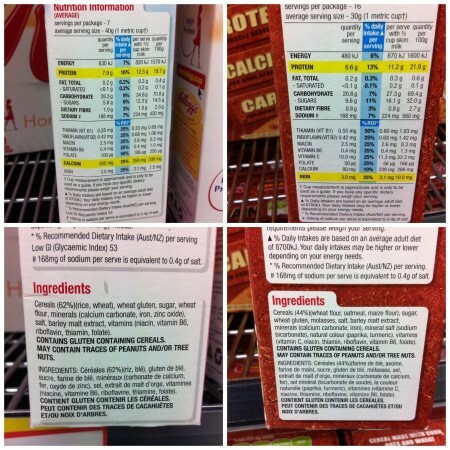 Not only do you have to contend with a refined cereal that provides no nutrients in its own right (and therefore vitamins and minerals are pumped back into it), but wheat and gluten causes so many problems for so many people, I kind of feel ripped off on behalf of anyone who thought they were doing themselves a favour when choosing ‘Ironman Food’ over eggs and bacon, and struggled through the after-effects of hunger, lower blood sugar later in the morning and difficulty with concentration levels. Have some more gluten and sugar with your cereal. Thanks, Kelloggs. So, what to eat for breakfast? If you’re not used to having a heavier meal in the morning it will take time to adapt – but adapt you will. If you are trying something new, then I recommend noting down how you feel in the few hours after you eat certain foods: that way you can begin to recognise how food affects you and it will help you make different choices later on down the track. Of course, if you feel like a rockstar after your bowl of Nutrigrain, then more power to you! Otherwise, give something else a go for breakfast. You’ve got nothing to lose. Hectic week this week. It’s felt like a long (short) one, and with end of semester looming, an exam to write for my students, and not feeling 100% thanks to an acute attack of the ‘vom’ on Thursday, it’s fair to say that I’ve been better. That said, a good night’s sleep has made a world of difference. Slept in till 7am, feel like a rockstar. And now I’m in Wellington for the Whole 9 workshop that is hosted by Whole 9 South Pacific, should be good. So what’s new with me? Not much. The universe continues in its effort to derail my best intentions to get a run in that is of length and intensity to be considered ‘training.’ Problematic when the Gold Coast half is mere weeks away. That’s thanks to a tight glute med and the aforementioned vomiting incident which has thrown my gut a bit out of balance. That was the first time I have been sick since one too many KGBs at the Orient during Orientation in 1999. And I have a REAL phobia about it – scares me the way people are scared of spiders. * Anway, I’m needing to up the raw apple cider vinegar and sauerkraut this week to get my good bacteria back in order. Needless to say, I’ll be relying on muscle memory and the finisher’s t-shirt to get me to the end of the Gold Coast run. I was in clinic this week with a lovely client who complained that she was getting tired of just eating chicken and vegetables, and wanted some new ideas. I furrowed my brow at her (I am very good at that) and said ‘but I’ve given you plenty of ideas to mix it up’, and started to go through the list of meal ideas I had provided her, to see if she really DID need more suggestions. She conceded that she’d not really put as much thought into what to eat as she could have, so, in order to NOT slip back into unhelpful habits, had stuck to a rather simple, yet non varied approach to her eating. The downside of this is that it can get old very quickly. And if it comes to the point where you couldn’t stomach one more chicken stirfry**, then it’s more likely you will slip into habits you’ve been trying to break. The truth is, people, a good and varied diet doesn’t happen by accident. It does take time and preparation. However, it is not as arduous as you believe. I tell my clients to set aside three hours in the weekend to prepare for the week ahead. I know what you’re thinking: come on, Williden. I don’t have three hours to do this! But it probably won’t take that long. However, it’s better to overestimate the time it takes rather than only scheduling an hour to plan, shop, and prepare your lunch and dinner in advance. It will only make you feel stressed, a bit rushed and, upon realising that it’s not enough time to achieve much, you will flag altogether. Honestly, once you establish a routine with this, it will take far less time. The other bonus is that you will be far less likely to come home to beans on toast at the end of a work day. Or (gross), stop in at BK for a combo. 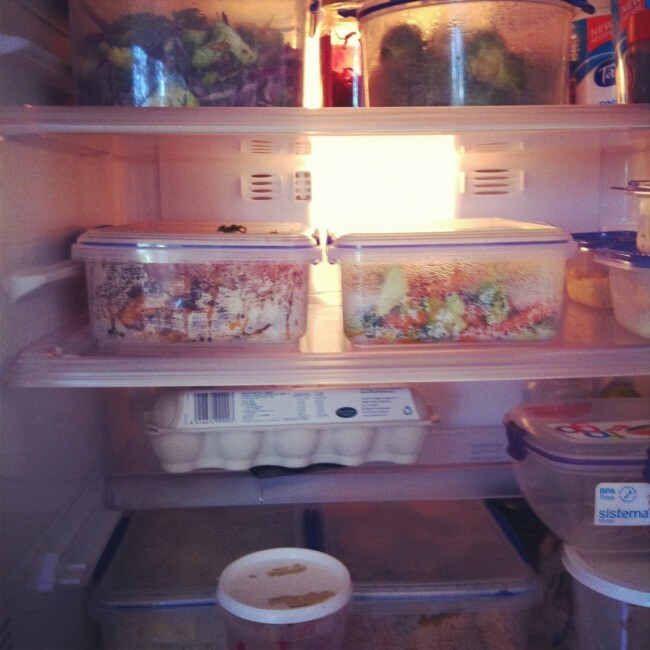 Today I had two hours to plan, shop, chop and prepare food for lunch and dinner for the week ahead. And I managed to complete it. I know what you’re thinking: ‘well, it’s easy for Mikki, she’s a nutritionist/foodie.’ Little known fact: I am a complete ditherer. I really am. Anyone who comes to my house for a meal at 7pm should expect to be eating at 9pm. However, when pushed for time I can come to the party. So, while it might not be the best way to do things, this is what I do and tell my clients to do: picked two salads to prepare for lunches, decided on the protein sources to have on hand, and chose which vegetables that can be prepared in advance to have for dinner. Today, armed with my shopping list, I was in and out of the supermarket in about 20 minutes. A record for me. Then I chopped, roasted, boiled, steamed and sistema’d. Now, I’m no Martha Stewart. 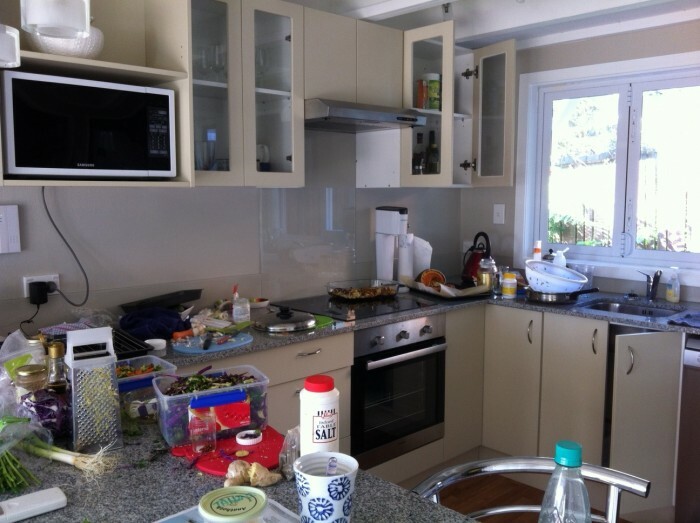 While I wish I could post some pictures of a perfectly ordered kitchen in amongst some frenetic preparation as evidenced by other food bloggers, evidence would suggest otherwise. This is like my step-by-step guide to cooking, except all of the steps take place all at once, culminating into one messy kitchen. made a Sesame Asian coleslaw and a warm winter salad for lunches. 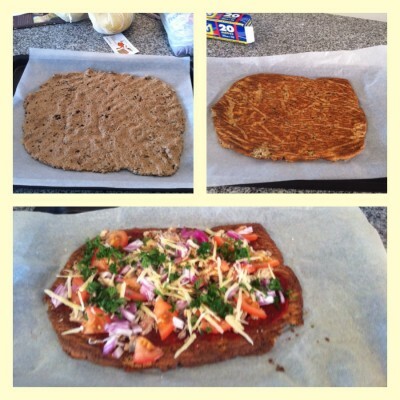 If you don’t think that what I’ve prepared would appeal to you, then I would say: think again (ala Jamie Oliver). The devil is in the detail. It’s not the ‘meat and 3 vege’ meal of the 80s (although there is nothing wrong with a hearty roast); start using those spieces that have been lurking around in the back of your pantry. Better yet, clear it out and start again. The best thing is opening a recipe book and seeing a list of ingredients you know are already in your pantry. It is amazing how satisfying it is to come home mid week knowing it will only take around 20 minutes before dinner is on the table. Instead of deciding to upsize your Whopper combo, it might be you need to upsize your fridge. Think about it as an investment in your future. Proof you can never have enough Sistema containers. * I also have a phobia about people wearing animal masks. Just makes me a little uncomfortable, in a George Orwell Animal Farm kind of way. ** Am I the only person who really doesn’t like chicken stir-fry? I feel really sorry for people who don’t like vegetables. Yes, vegetable lovers, there are actually people out there who don’t go near them with a barge pole. Well, actually, sometimes I feel sorry for them. It usually depends on what mood I am in. Sometimes, while I might nod understandingly, in my head I’m like “what are you? 12? !” A bit mean, eh. It’s involuntary too – I don’t mean to feel disdainful, but, depending on the day, if someone can count on one hand the vegetables they do like, and ‘frozen mixed vegetables’ are three of them, I kind of feel like telling them to man up and eat their greens. At any rate, I can see that their quest for health improvements and/or performance benefits through diet is made just a little bit trickier. For these people, you can pretty much guess that their lasting memories of eating vegetables was when they WERE 12, where it was almost compulsory to boil any vegetable to within an inch of its little green life. Actually, past that point. Dead, buried and eating sandwiches at the memorial. If that’s what you think vegetables taste like and that’s why you avoid them the same way you avoid opening mail from your bank, then rest assured, noone likes those vegetables either. While I’m not always sympathetic, I totally get it. When mum used to serve us leeks I used to throw them under my sister Hayley’s highchair and hope the folks would think Hayley had dropped them. Unbeknownst to 8 year old me, Hayley was eating some pureed number that didn’t include leeks! But I digress. Another reason I get from people for not eating vegetables is that they go bad at the back of the fridge and can’t be used. Somehow this argument is made as if it’s the fault of the produce and not the person purchasing them. I can tell you right now, that won’t happen if you plan to use them, and not just buy them. But if someone truly doesn’t think they like the taste of vegetables, then we need to work on finding ways to increase their intake in an acceptable way. I’m not talking about ‘sneaking’ vegetables into, say, a chocolate cake. Vegetables deserve to be celebrated, not stigmatised. And since we’re talking about vegetables, I guess now is time to break it to you that (in my opinion) 5+ a day doesn’t cut it. 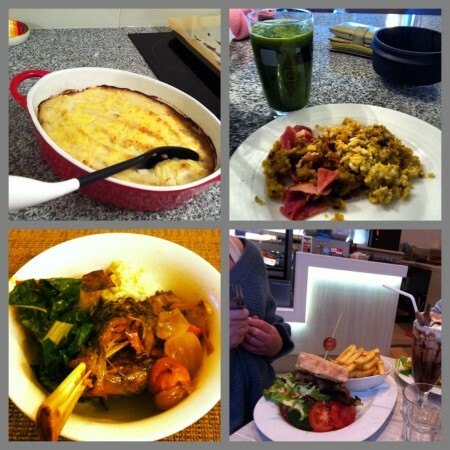 If you are serious about reaping the benefits of a good diet then you need to think bigger. Australia has a go for 2 and 5 campaign for fruit and vegetables and Canada shoots for up to 10 serves per day. Us Kiwi’s typically punch above our weight and come out on top, and it should be no different in the vegetable arena. Stirfry brussel sprouts in coconut oil, and add bacon, hazelnuts and a glaze of honey and orange juice (see below). My friend Caryn served this to me and it is awesome. Grate beetroot into a standard supermarket coleslaw mix, sprinkle with pumpkin seeds and cranberries and ditch the nasty store bought dressing for your own lemon juice and olive oil mix. Cut carrots into batons, drizzle with melted coconut oil and sprinkle with cinnamon. Roast until done. Microwave cabbage leaves for around 30 seconds until soft and use as wraps for some leftover meat, avocado, grated carrot and courgette. 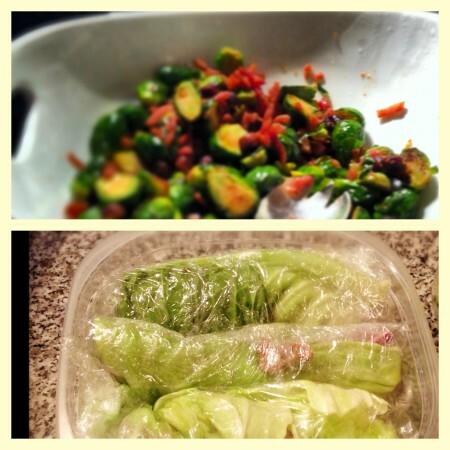 If you wrap them in Gladwrap to prepare for the next day, they won’t go soggy the way normal wraps will. Thaw out a bundle of two of frozen spinach in the fridge the night before, and mix into your scrambled eggs for breakfast. *the jury is out on the ‘porridge’ idea. It wouldn’t be my first choice, but it piqued our interest so we thought we’d try it.